The RCFY meetings are the second Thursday of the month, 9 am to 10:30 am at Raymond Baptist Church on route 27 in Raymond. For more information contact Celeste Clark at 895-7061 or visit the RCFY website . RCFY Summer Series Jumps Off To A Great Start! 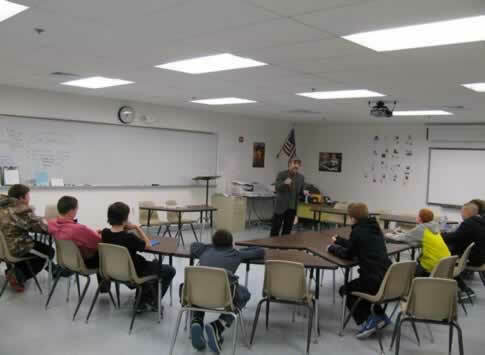 IHGMS 7th graders attend classes to address current issues impacting teens today. 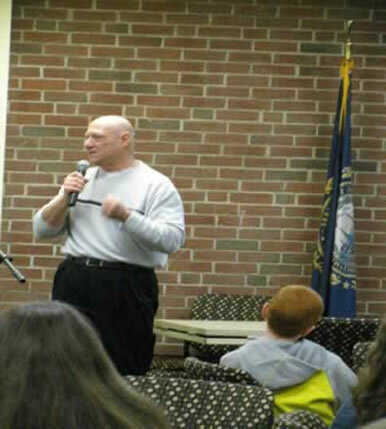 On January 15, 2014 81 seventh grade students and their teachers from IHGMS along with parents attended the 10th Annual Project Safeguard at Seacoast School of Technology in Exeter, NH. This day was planned in partnership with the Raymond Coalition For Youth and the Raymond School District teachers and staff. 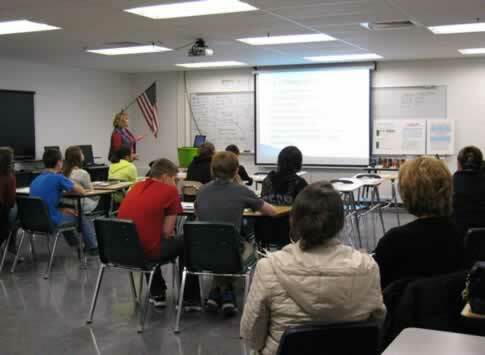 Project Safeguard is an offsite conference day designed especially for seventh grade students and their parents or guardians, addressing current issues impacting teenagers today. 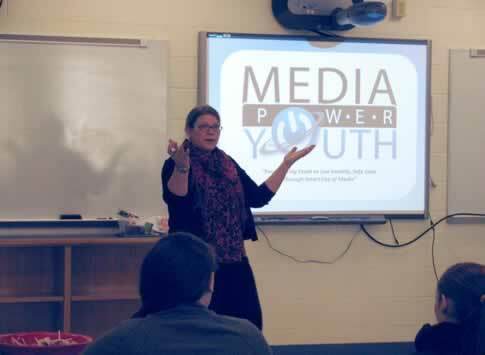 RCFY works with many of our partners who are experts in their perspective fields to offer a variety of classes to choose from that include peer pressure, self-esteem, tobacco lies, media messaging, the dangers of energy drinks and much, much more. Guests speakers included Tami Cole from Whole Foods Nutrition Programs, Rick Alleva from UNH Cooperative Extension, Chief Salois and Officer Frotton from the Raymond Police Department, Rick Labell from Labell Presentations, Sarah Shanahan from Media Power Youth, Emily Murphy from Sexual Assualt Support Services, Tami Reardon from Raymond Recreation Department and Kirsten Roman & Caitlyn Downey (Youth Action Alumni). Celeste Clark from RCFY and Tami Reardon from Rec. Dept. 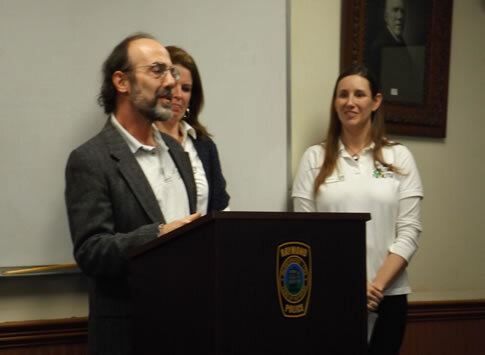 Project Safeguard began over 20 years ago in Merrimack, New Hampshire, when a middle school teacher recognized that middle school was a transition time for young people and that their exposure to risky behaviors increased significantly as they entered the preteen years. IHG Middle School is one of the lucky schools that can participate in such a great event through the collaboration, resources and funding provided by the Raymond Coalition for Youth. Walmart and IC Reed provided funding for this event. We would like to thank them for supporting our youth and positive choices. 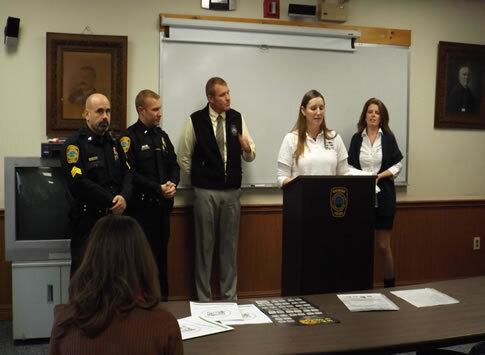 At a news conference on Wednesday, Oct 30, Christine Bostaph, Chairman of the Board of Directors for the Raymond Coalition For Youth (RCFY), complimented the Coalition’s Executive Director, Celeste Clark, for her continued efforts in preventing drug and alcohol abuse among local youth. Upon seeing that, Clark decided that was not right so she called, emailed and mailed letters to the company requesting to speak with them personally. She wanted to make them aware that using medicine bottles as promotional items with candy and gum inside was putting out the wrong message since Prescription Drug Abuse is a major issue with young people in America. McLaughlin’s letter stated that he wrote to the company’s 500,000 customers informing them the bottles have been removed from the website and personally contacted the 30 clients who purchased the prescription drug bottles to inquire about how they use them and make them aware of the prescription drug abuse situation in the country. Clark said she has received over 50 pages of comments from Branders.com customers praising their decision to remove the bottles after contacting them. 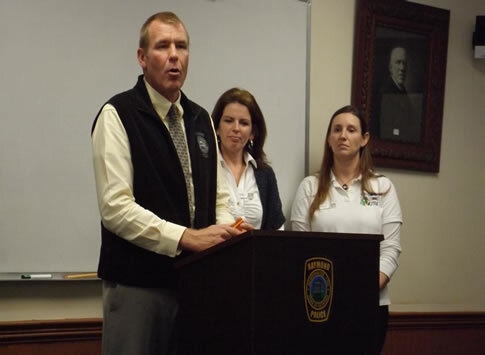 Police Chief David Salois said, “ the message in the bottle is all about consistency and the prevention of drug abuse”. 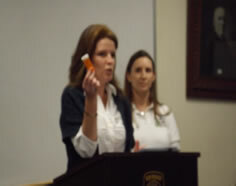 To learn more about prescription drug abuse and what you can do about it visit www.DrugFree.org. To watch the press conference on RCTV click on RCFY Press Conference. The Raymond Coalition for Youth works to promote healthy positive choices in our community. To learn more about the RCFY visit their website at www.rcfy.org. Summer is quickly coming to a close. The Raymond Coalition for Youth held their Summer Fun Series programs at Riverside Park on Sundeen Parkway during the summer. The last Summer Fun Series night is taking place Thursday August 29 at the Raymond High School from 6:00-8:00 pm. These free events were targeted for middle school and high school students, their friends, and families. Supported by a grant provided by Dartmouth Hitchcock this Summer Fun Series is designed by youth for youth to provide two hours of unplugged fun in which participants can “get out of the house, socialize with old friends, meet new friends, share some healthy snacks, and just have fun right here in our town,” as stated by RCFY members. The last event will be a Movie Night. Left to right: Olivia Wood, Dale Cote, Jared Palmer, Livia Palmer, Katarina Vogel, and Wyatt Cramer. Each participant receives a free raffle ticket for attending, and can earn additional raffle tickets for bringing a friend and completing an event evaluation form. The free raffle prizes include gift cards for Wal- Mart, I-Tunes, Verizon, Hannaford Supermarket, Dunkin Donuts, Long Branch Restaurant, and gift donations from Pop Culture as well as The Manchester Monarchs. Healthy and tasty refreshments are provided by RCFY. For more information visit The Raymond Coalition for Youth on Facebook, or contact Christina Vogel, Summer Series Leader at Christina.vogel@comcast.net or by calling 686-2092. This year the RCFY is providing free, fun, healthy activities for the youth of the Raymond Community and their families. These events will offer an opportunity to connect with friends, get outside, exercise, have fun, and enjoy social company. Each Thursday evening a different activity is planned to get the youth of Raymond moving in a variety of events such as pick-up soccer, ultimate Frisbee, flag football, or capture the flag. Other activities could include a summer dance with music provided by a local band and/or a DJ, a poetry slam, a picnic with old fashioned games, wacky Olympics, and much more. Each week a different healthy snack will be featured, with ideas to take home. A brand new playground is nearby for added enjoyment. 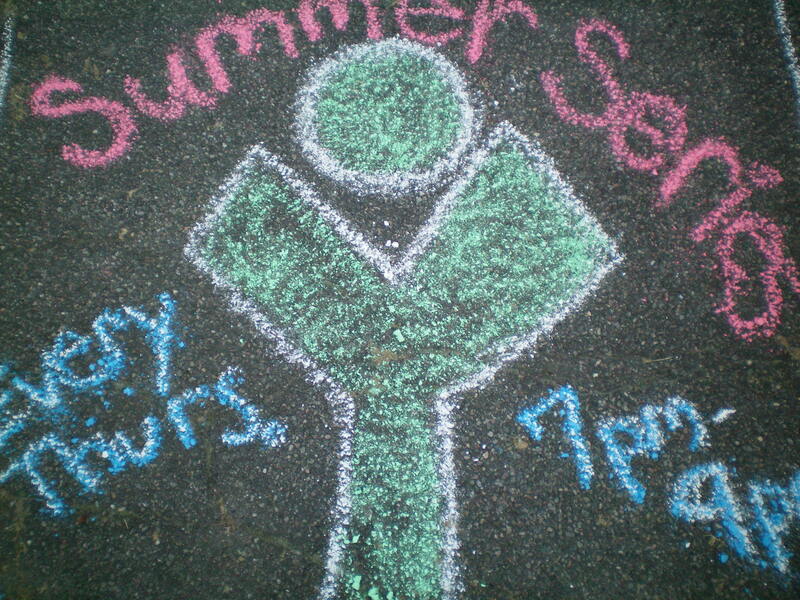 The Summer Series will be held at Riverside Park at the end of Sundeen Dr, Raymond, NH from 6:00 pm to 8:00 pm on Thursday Evenings from July 18-August 29, 2013. The RCFY Summmer Series is Sponsored by a grant provided by Dartmouth College to promote a Healthy Living and Eating Lifestyle. The RCFY is committed to community involvement. We always welcome volunteers and the sharing of ideas to bring our community together for positive youth development.